Last weekend when we were driving through Southern Utah seeing the beautiful sights, the kids and I stayed at my Uncle Mark and Auntie Barb’s house in St. George. We had been driving all day long and, when we arrived at their house, they had a big pan of beer brats on the stove. It was so nice to have dinner waiting, especially a dinner as delicious as this one! Barbara explained how she and Mark cook their brats and I made them myself just two days later! This is definitely my new favorite way to cook brats. And it’s super easy, with just three ingredients! There are few notes throughout the recipe with hints and tips. I figured it’s better to just put all that info right into the recipe instead of here in the blog post. Enjoy!!! Mark and Barbara are my aunt and uncle and they make the best beer brats ever. 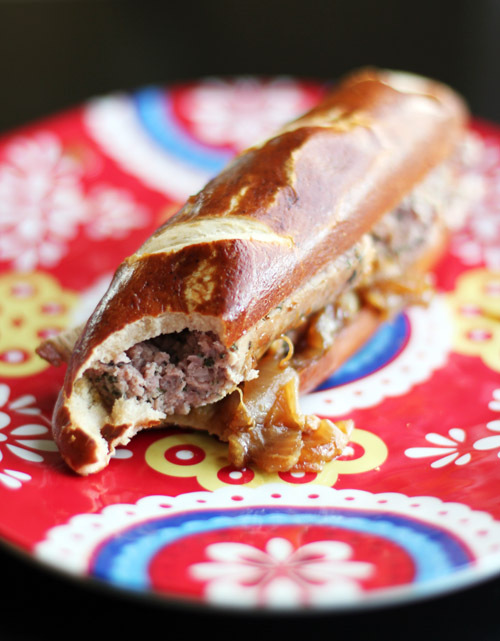 Place the sliced onions and the brats in a high-sided skillet. 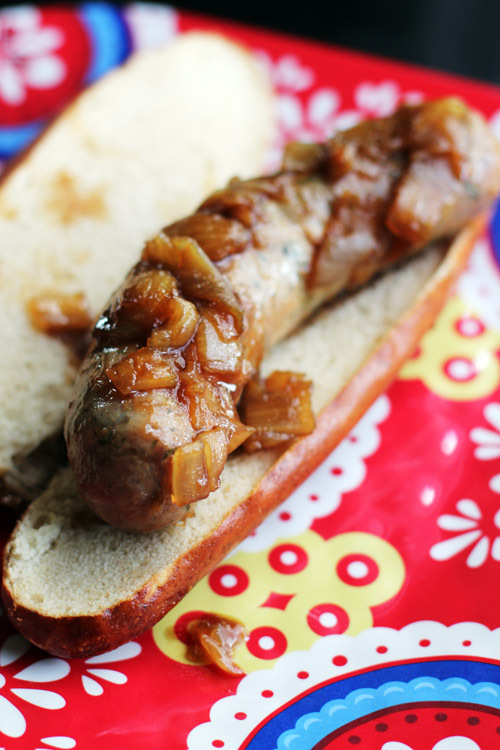 Pour beer over the brats and onions until they are covered. Heat over medium-high heat to bring to a simmer. Reduce heat to low and simmer for 30-60 minutes, until the brats are cooked through (internal temperature 170º F). 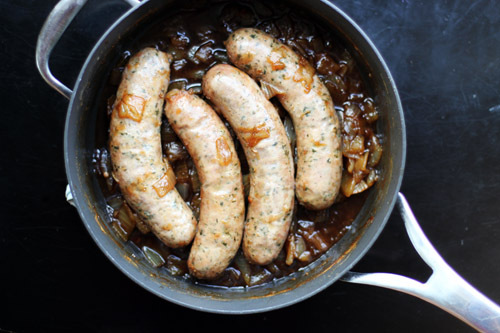 Make sure brats are simmering, not boiling, but you don't want the heat too low so that they're not cooking. Remove the brats from the pan and set aside on a plate. Cook onions until beer is almost completely cooked off, leaving you with saucy onions. Add brats back to the pan, raise heat to medium and keep them on the heat until they are hot again. 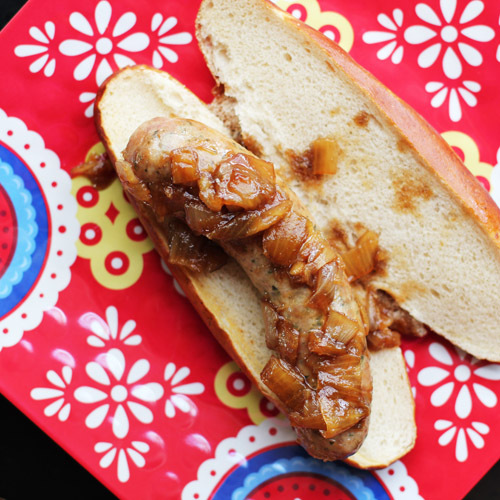 Serve brats smothered in the onions on buns of your choice with mustard of your choice. Barbara mentioned sometimes they'll make these ahead of time and refrigerate or freeze them. When it's time to eat them, if frozen be sure to defrost, then heat the brats up on the grill and heat the onions in the microwave or on the stove. My husband’s name is Mark. I guess I’d better make these soon. This sounds wonderful for summer!! for sure! but, honestly, they’d be great all year they’re so cozy! I’m sure you’ll like them, bailie! I need to find those pretzel rolls! They looks so good and my oldest loves pretzel rolls (new found love).